How do you like running in a skirt/skort? I've seen them and they look cute, but I don't know how I would like it! I love running in a skirt. They hide all the unpleasantness short tights reveal. What's important is that the tights beneath the skirt are long enough, so you won't chafe. Running skirts are the best thing since sliced bread as far as I'm concerned. Awesome! I need some new running clothes. I love running too...running my 3rd half marathon on Sunday. Getting nervous! New follower from the blog hop. 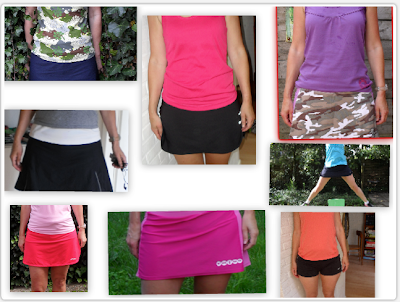 I haven't tried a running skirt yet, but I have always thought they might be neat. I have been injured for 9 months now, so hopefully I'll be back running in the next month or 2. Cool outfits! I love the pink skirt! You are a very stylish runner!! I need some new working out clothes and these are REALLY cute!! I want a running skirt...I haven't tried them! You like running in those better than compression shorts? Hi Marissa, I most certainly prefer running skirts over compression shorts! But a lot of that has to do with my vanity! I just hate the way I look in those stupid shorts. Why not cover up the bad bits with a skirt? !